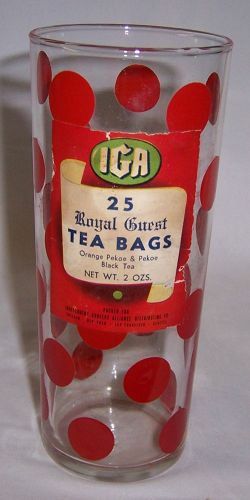 This is a really great crystal 6 1/2 inch high vintage Red Dots IGA TEA BAG Advertisement Tumbler made by Hazel Atlas. This Tumbler measures 2 3/4 inches across the top and is in excellent condition with no chips or cracks. The advertisement and Red Dots decorations are all very good. On the label IGA 25 Royal Guest TEA BAGS, Net Wt. 2 oz.